This is the second post in the Quick Weekend Getaway to Napa / Sonoma Series. Other posts in this series include: Benzinger Family Winery. Sometimes there comes a point where you just can’t eat and drink anymore. Yes, you can visit winery after winery after winery between your meals, but at some point, you hit a wall. Bryan and I generally like to be active on our food trips. In certain large cities like New York, Rome, or Las Vegas, it’s easy to burn off our meal calories by walking a lot between lunch and dinner. Napa and Sonoma, however, aren’t quite built that way. The rolling vineyards are beautiful, but it’s hard to walk between wineries and restaurants. The town squares for most of these cities are small, and you’ll go from one end to another in 10-15 minutes. So we seek out physical activity. On our last trip, we took a multi-hour cycling trip around Sonoma, which was fabulous. This trip, we spent several hours hiking through Jack London State Park. The park conveniently happens to be located just a couple minutes (by car) away from Benzinger Family Winery, where we’d had our tour earlier in the day. Jack London State Park was the home of the famous writer Jack London, author of books like White Fang and The Call of the Wild. His family donated the property to the state of California after his wife’s death in 1955. Jack London was the richest, most famous, and most prolific writer of his generation. He was also an entrepreneur, an innovative farmer, and a world traveler. He died tragically young, at the age of 40, but lived an insanely full and adventurous life. If you have time, take a guided tour, which is what we did. They are free and well worth it. Our tour guide was passionate about the park and Jack London’s life, and it showed. Even though I knew nothing about Jack London before I visited the park, I came away from the visit fascinated by his short, extravagant, and productive life. Throughout the park, you get different glimpses of all the crazy things he tried in his life. Here is the House of Happy Walls, which is where Jack London’s wife lived up until her death in 1955. It is a museum that holds a lot of souvenirs that Jack London and his wife picked up from their 27-month voyage (via a boat Jack London built) to the South Seas. 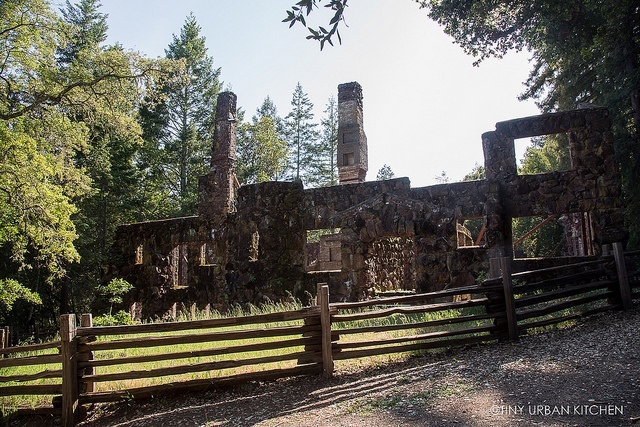 The Wolf House ruins show the mansion that Jack London almost completed before it was destroyed by fire just a few weeks before he was slated to move in. The loss of the house made Jack London go into depression, though he still forced himself to keep writing. It’s haunting to see the ruins of the house today. They have been untouched, and basically look the same as they did right after the fire in 1913, just over a hundred years ago. Left: another view of the Wolf House ruins. Right: view from Jack London’s cottage where he died. The grounds of the park are really pretty and there are all sorts of different trails for hiking, horseback riding, and cycling. You can see a map of the entire grounds in this brochure. Horseback riding is a popular activity at the park, and you can go for miles through those trails. We visited our tour guide’s horses, who happily ate the cookies that Bryan was feeding them. In the summertime, they often host performances in this large open-air “theater”. A popular act is a concert by Broadway singers from New York. The park has picnic tables and barbecue pits. In fact, our original plan involved a lovely picnic at the park. Unfortunately, because our schedule was all messed up, we ended up eating our sandwiches early, during the Benziger tour. I still would like to share about these sandwiches with you though, because they were absolutely fantastic. The folks at Jack London State Park were kind enough to pick up some sandwiches for us from Glen Ellen Market, which is just down the street from the state park. This sandwich is called the Jack London and was my favorite. I loved the unique textured bread, which I can’t even begin to describe except to say that it was crispy on the outside and soft on the inside. This huge sandwich ($7.99) had turkey, crispy bacon, sprouts, avocado, lettuce, and Jack cheese. The Spicy Roast Beef Panini was also excellent, and consisted of rare roast beef, horseradish sauce, Sonoma Horseradish Jack cheese, jalapeños, tomato, and bacon. I would highly recommend the sandwiches at Glen Ellen Market. The market is also just located a couple minutes from Jack London State Park, so it’s a great place to get sandwiches if you want to have a picnic there. Hiking around this park was the perfect afternoon activity before dinner, where we would again consume more excellent food and lots of great wine. It was really nice to take a break to enjoy the outdoors, learn some history, and get some exercise! Disclaimer: this tour was organized for us by the Sonoma County Visitor’s Bureau. We did not pay for the sandwiches, which were provided by the kind folks at Jack London State Park. All opinions are my own. Dutch Crunch bread! It’s all over here in CA but was totally new to me when we first moved from the East Coast. I’ll be sure to put the park and the market on our list next time we venture into wine country. Beautiful pictures, Jennifer. Those sandwiches from Glen Ellen Market look amazing! Toasted sandwiches are, no doubt, one of my (many) weaknesses. So happy you took so many great photos…the park is just incredible, with over 30 miles of hiking and riding trails…you guys really covered a lot of ground! Buzz (horse) looks pretty happy to see you, too. I am sure your great info and images will bring people to visit Glen Ellen. Horseback riding can be booked through Triple Creek Outfit, and we recommend it so much, they are great…Since we are neighbors of the park we are proud to see it thriving, and grateful for the blog posting–Thank you! Thanks for the information about horse back riding! I wasn’t sure how people could book riding tours so it’s helpful to know. Thanks!